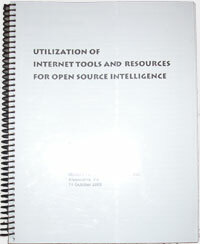 Online Strategies provides training in using open sources, particularly the Internet, for effective and efficient information collection for OSINT (Open Source Intelligence) applications. Online Strategies' OSINT seminars are presented at the customer's site and have been given to a variety of governmental agencies and ministries of three countries, and also to companies, associations, and conferences. Course content is tailored to the specific customer and the length of courses can range from one to three days. Some Key Intelligence "Starting Points"
News Resources - The Epitome of "Open Source"
How to easily locate, access, and search newspapers, news networks, blogs, and other news resources. Having news, blogs, and other information automatically delivered to you. Webpage containing links for all websites covered in the session. (Example) This is available to attendees both during and after the session. Laminated Quick Guide to Google. Using automatic alerting services provided by search engines, plus an examination of programs that can immediately alert users to changes in any public webpage. How to identify and access this immense body of material and easily find the hidden jewels of valuable information. Techniques and resources for finding information on individuals. A brief look at searching major sites such as Twitter, Facebook,LinkedIn, etc. Finding images using image search engines and other resources such as Flickr. Finding radio stations, podcasts, speeches, etc. Searching for video using major search engines and other resources such as YouTube. This is a brief sampling of resources available for selected regions, countries, and special topics. For the last sixteen years Ran Hock has been creating and presenting courses on using the Internet effectively for research. Over his career he has trained over 15,000 online users in thirteen countries, including presenting OSINT courses for intelligence agencies of three countries and courses for major international organizations. Ran is the author of eight books on using the Internet and is a frequent contributor and columnist for professional publications. Ran has held management and training positions with DIALOG and Knight-Ridder Information Services, and has been a reference librarian at MIT and the University of Pennsylvania. In addition to his training and writing activities, from 2007-2010 he served as an adjunct faculty member for the Johns Hopkins University Masters Degree Program in Intelligence Analysis (Division of Public Safety Leadership) and currently serves as adjunct faculty for at The Catholic University of America where he teaches the course, "Actionable Intelligence: Information Analysis and Communication". To inquire about courses, call 855-244-0400 (from within the U.S.) or 001.410.224.0400 (from outside the U.S.) or email Ran at ran@onstrat.com.